For the past couple of years, especially but not exclusively for Mickey’s Not So Scary Halloween Party, there have been character mugs available to liven up your soft serve ice cream selections. For 2012 the mug has gone M.I.A., or Missing In Autumn. 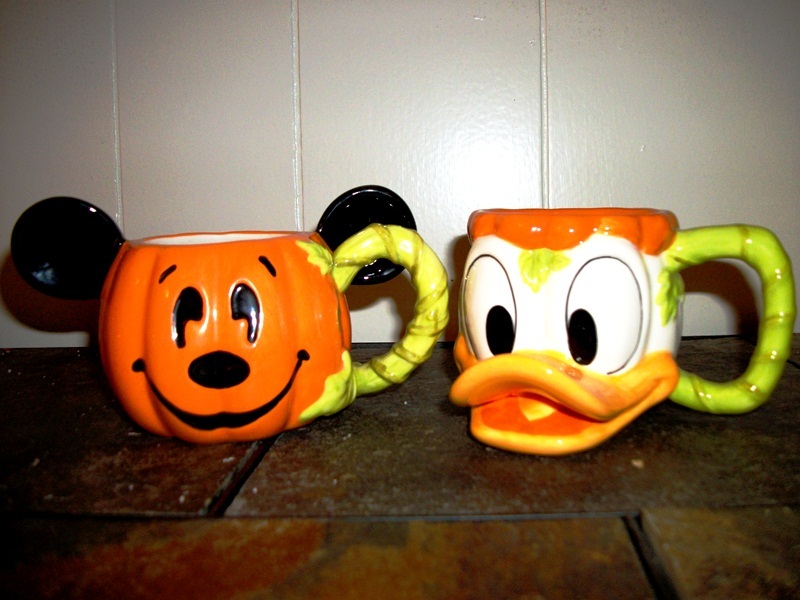 The 2010 mug, found at Aloha Isle for Dole Whips and elsewhere around the park for soft serve, featured Mickey Mouse carved from a single pumpkin with a vine curling around to become the mug’s handle. 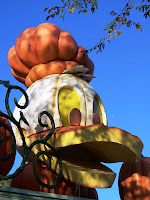 The 2011 mug featured Donald Duck, cobbled together from a couple of pumpkins, one of them white, with a vine handle. 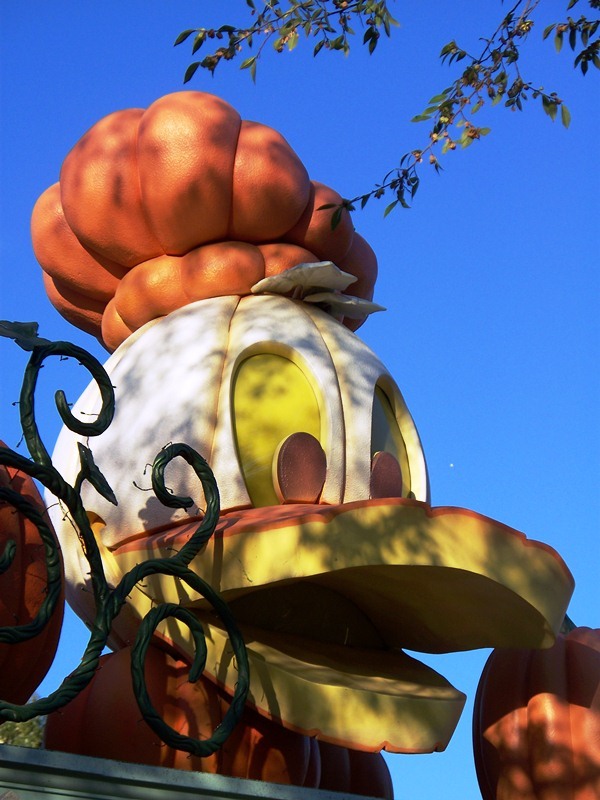 In the case of Donald, he very much resembled some of the Halloween decorations seen at the entrance to Disneyland. While they have only been present for the past couple of years, this year their notoriety comes from their absence. According to Cast Members at Sleepy Hollow Refreshments (and a big thank you to Elizabeth Driscoll for doing the leg work for me!) the manager who had the idea for the mugs previously is no longer in that position. Apparently, no one else thought of the idea, or at least not in time for the mugs to be ready for this fall. These mugs were an added cost, but they were well made ceramic mugs which offered a great way to remember your trip and infuse a bit of Disney magic into your fall festivities at the same time. It appeared that the mugs were to be part of a series, starting with Mickey Mouse, then Donald Duck, and moving on to what I hoped would be at the very least a cycle of the Fab 5, Mickey, Donald, Goofy, Minnie, and Pluto, before starting over. It was clearly not to be. We often lament that we receive less for a higher cost of attending Walt Disney World events or even just gaining entrance to the parks. While I’d love to include this in that category, I’m not sure it fits, as it was simply a souvenir. It does, however, showcase how some brilliant ideas for takeaways can get lost in the shuffle. It is my sincerest hope that the mugs return next autumn. Until then I will decorate my mantle and sip my cider and cocoa with Mickey and Donald, and let my memories carry me back to the great times we shared in the Magic Kingdom over the past couple of falls! At least they got the two biggest characters done. It's always sad when a great project dies unfinished because of a staff change...I've seen that happen with attempts to bring back out-of-print book series. I have the Donald mug and wondered why they didn't have them again this year. Sad. Rich and Melissa - I'm hopeful that if enough people ask and comment about the mugs, then maybe someone will get the line restarted next year!